Since I've given up shopping for a little while, I had to come up with an idea for my mom for Mother's Day that involved things I have around the house ... 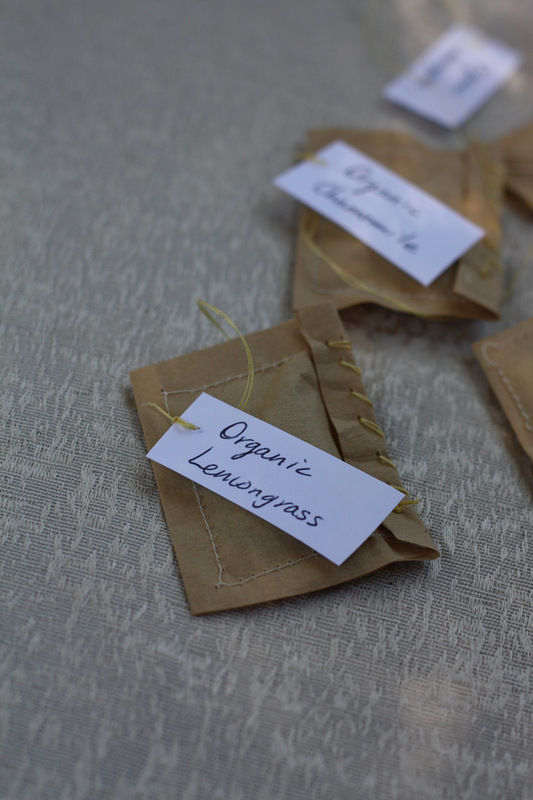 I checked out loads of great craft blogs and found gorgeous handsewn tea bags on Merriment Designs. Which inspired me - my Mom loves tea! But, not having beautiful fabric like that lying around ... I thought I'd improvise by using unbleached coffee filters, cut up into tea-bag sizes and sewn around pockets of some of my favourite herbal teas. Then attach a little message on the tag, and voila! 1. Cut small squares out of your coffee filters, through both layers at the same time - it really doesn't matter if the squares are unsquarish sorts of shapes, I think the imperfections make them cute and rustic. 4. Cut small rectangular tags out of card stock and use the needle to poke a hole in one end. Loop the thread through and tie it off. 5. I wrote the tea variety on one side of the tag and nice messages to my mom on the other. So that when she has a cuppa, she'll be reminded how special she is! I won't let on how little this actually cost me, but coffee filters are $2 for a pack of 40 and I used about 3 or 4 filters to make a dozen tea bags. I had all the teas already ... And this was my first day sewing on a sewing machine in about 15 years or so ... so we're talking really simple here! I LOVE this idea! I am a big tea fan, and I especially love this tea that they carry at Aveda salons. It has natural sweeting with licorice and makes a really lovely cup of tea. Buying it prepackaged (in bags already) is way more expensive than buying it loose, but then it become difficult to transport to work etc. Making these little filter bags would work perfectly for me!